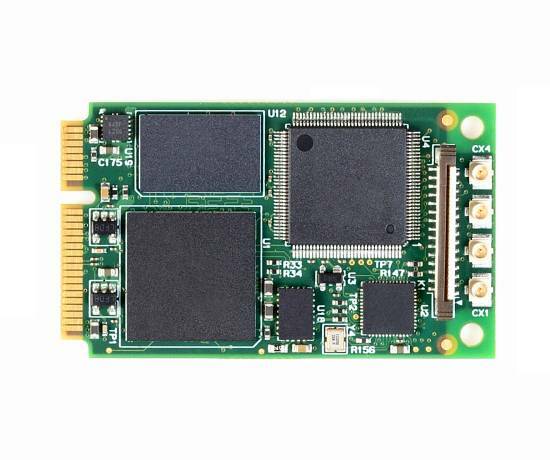 The nanoH264-D4 is a 4 channel H.264 encoder on a single miniPCI-express card. The nanoH264-D4 provides a powerful and flexible solution for capturing and compressing 4 analog video inputs at full size and at full frame rate to either H.264 of M-JPEG encoding standards. The nanoH264-D4 allows high quality real-time video capture and compression from NTSC/PAL/RS-170 video sources for storage to disk and transmission over Ethernet networks. The nanoH264-D4 is supported by comprehensive SDKs that minimize development risk and shorten time-to-market for applications in video streaming, recording, or routing. The SDKs are available for popular operating systems such as Windows and Linux.